Whilst arranging my old belongings in preparation for moving home I came across an old computer cassette that I created years ago for a covertape which was to be given away with a fanzine I used to edit when I was younger.The publication focused on the retro Commodore 64 computer and every issue we would put either a 5¼” floppy disc or cassette (depending on whether or not the customer owned a floppy drive) filled with game demos on the front cover. Punch Cards – Whilst they have been around for centuries (used previously in a mechanical capacity on machines such as textile looms and fairground organs), punch cards found a use in the early to mid twentieth century in data storage and entry.Information could be recorded by the presence, or indeed absence of a punched hole in a predefined position on pieces of stiff paper.Whilst physically difficult to store and cumbersome to operate, punch cards were extremely widely used in the early days of digital computing. Tape formats – Tape formats have been around for decades in digital computing and indeed still remain in use to this day especially when backing up large quantities of data.Of particular interest to me is the recording data on conventional audio tapes which occurred mainly through the mid 70’s and into the 80’s.Due to the cost conscious nature of home computer users at the time, many computers were equipped with analogue to digital converters so that binary instructions could be altered into noise and stored on to a standard audio cassette.An old 56k computer modem works on much the same principal to transmit digital data down a phone line designed to carry sound. 8-inch Floppy Disc – These became commercially available in 1971 and originally had a capacity of just 79kb and were later superseded by the 5¼” floppy disc when the previous format was deemed too large to be practical.These formats both used discs that were genuinely floppy; their bendable nature and minimal shielding from the outside world made them a precarious format to store data onto. 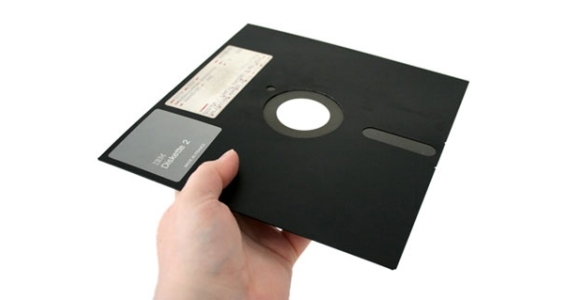 3.5” Floppy Disc– Whilst several sizes were developed to replace the 5¼” drive, it was the 3.5” floppy that was widely adopted and became commercially successful.Whilst the storage medium is actually floppy it was protected by a rigid plastic outer shield.Despite being introduced back in 1984 it was remarkably still relatively popular up until a few years ago. Floppy Replacements – The standard 3.5” floppy drive was limited to 1.44mb which over time came to be considered a restrictively small capacity.Several attempts were made to create an alternative including Flextra (1988), Floptical (1991), Zip (1994), LS-120 (19950, HiFD (1997) and UHD144 (1997) however unfortunately despite higher capacities, faster speeds and often backwards compatibility, a variety of problems ensured that none of these formats ever established themselves as a ‘standard’ . It wouldn’t feel right not giving Refresh a little plug at this point since storage media is a huge element of our business and on items such as CD’s, DVD’s and Flash Drives I feel that we cannot be beaten locally on price.With regards to covering history post floppy disk, I have written several articles regarding newer optical media such as CD’s and DVD’s in the past which can be downloaded at www.computerarticles.co.uk. About the Author – Chris Holgate works for Refresh Cartridges who supply a wide range of printer cartridges at the UK’s lowest prices. © 2012 Computer Articles. All Rights Reserved. While we are happy for you to link to any article published for the purposes of reference, please do not replicate elsewhere without our express prior permission. © 2019 Computer Articles. All Rights Reserved.